As counterterrorism officials investigate a new ‘credible’ terror threat, records show there have been at least 45 jihadist terrorist-attack plots against Americans since 9/11—thwarted by intelligence work, policing, and citizen involvement. John Avlon reports. As news of a new “credible” threat swept across the nation on the 10th anniversary of 9/11, Americans were abruptly reminded that terrorism is always one bad day away from being issue No. 1. In the latest case, one report said at least three people—one believed to be a U.S. citizen—entered the U.S. in August to plan a car-bomb attack against Washington, D.C., or New York. The suspected terrorists are thought to have come from Afghanistan or Pakistan, and at least two rental trucks are being sought nationwide. White House officials confirmed that President Obama had been briefed on the “specific” terrorism threat. Too often, 10 years after the worst terrorist attacks in our nation’s history, we sometimes fall into a false sense of security as a degree of 9/11 amnesia takes hold; a desire to recast the attacks as a tragic isolated incident. The facts tell a very different story. The record shows that there have been at least 45 jihadist terrorist attacks plotted against Americans since 9/11—each of them thwarted by a combination of intelligence work, policing and citizen participation. And these are just the plotted attacks that we know about through public documentation—the real number of credible plots is no doubt much higher. No truly authoritative list exists because of the preponderance of classified information, although organizations such as the Heritage Foundation have published detailed lists in the past. An additional problem in coming up with a comprehensive list lies in consistently defining the parameters of thwarted attacks. The plots also are of varying degrees of seriousness, from some that were days from causing mass bloodshed to others that were twisted ambitions caught well before fruition. The list published below comes as close as I could, using public sources and past lists—and it was reviewed by both government and academic organizations that track terrorist attacks. Since 9/11, there have been devastating terror attacks in cities like London and Madrid. But America has so far batted 1,000 against the constant stream of civilian-targeted terror threats, though trends show the types of plots are changing to an increase of military targets (think the deadly shooting spree at Fort Hood by Army Maj. Nidal Malik Hassan) and Americans’ training overseas for the purpose of terrorism. Professor Erik Dahl of the Naval Postgraduate School in Monterey, Calif., and the START program at the University of Maryland has compiled the most detailed list of attempted terrorists attacks to date, spanning a period of 25 years, in his paper “The Plots That Failed: Intelligence Lessons Learned From Unsuccessful Terrorist Attacks Against the United States,” recently published in the academic journal Studies in Conflict and Terrorism. Interestingly, while compiling his list, Dahl found that “about 75 percent of the plots are associated with radical Islamists and about 25 percent are from right-wing domestic, anti-government militia movements.” But for the purposes of marking the 9/11 anniversary, this list focuses solely on the Islamist terrorist plots against Americans at home or on military bases outside war zones overseas. An additional point of consideration is the cooperation that Muslim Americans have given to police that has helped stop many terrorist plots to date. “Local law enforcement and FBI officials have very good relations with the mainstream Muslim communities in various parts of America,” attests Dahl. In the absence of another major terrorist attack on U.S. soil, it can be too easy to ignore the heroic efforts that have saved countless American lives over the past decade we have been at war. We now know that Osama bin Laden had long hoped for a 10th anniversary attack; and the threat of a lone wolf attack may be at the heart of this latest credible threat officials are investigating. But America’s first line of defense will be especially vigilant on this anniversary of the day when Islamist terrorists declared war on the U.S. Looking to the future, Dahl sees a need to remain focused on the threats we face, while working to achieve the right balance “between reporting on things, the ‘see something-say something’ approach on the one hand, and respecting civil liberties and the rights of individuals to go about their daily lives. We still haven’t figured out just where that balance is in America.” But in our democratic republic’s response to 9/11 and subsequent civic debates we come ever closer to finding the right balance. After the attacks of 9/11, we swore that we would never forget. And so, among the memorials on this 10th anniversary that honors the victims and heroes we lost, it is also appropriate to remind ourselves of the need to remain vigilant. 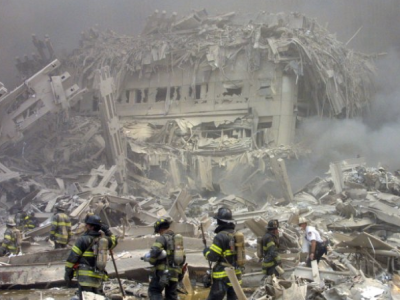 We honor the dead from that day by resolving to do all we can to stop future 9/11s. First responders have a saying: “Hope for the best; prepare for the worst.” The civic resilience of the United States in the wake of the attacks of 9/11 is a testament to the power that free people have to overcome the forces of fear. We have been both lucky and good, and—as this rogues’ gallery of foiled terrorist plots reminds us—we all owe the broader counterterrorism community our thanks. America is the land of the free because we are the home of the brave. Plot to attempt a second 9/11-style aerial attack to topple the tallest building in Los Angeles. Accused of meeting with Khalid Sheikh Mohammed in a dirty bomb plot. Sentenced to 17 years in 2008. Seattle-based terror cell plotted to support the Taliban. A man and a woman of Turkish heritage—the man born in Germany—are arrested for plotting to blow up U.S. Army headquarters in Germany. Six Yemeni-Americans are accused of conspiring to help al Qaeda and plead guilty. Seven Oregonians arrested in plot to join the Taliban and wage war against the United States. Reported by Ron Suskind in The One Percent Doctrine. Plot to destroy the Brooklyn Bridge. Virginia group trained for apparent urban warfare missions, including training in Afghanistan. Plotted to bomb a Columbus, Ohio, shopping mall. Plotted to bomb locations in New York, Newark, and Washington. Plotted to bomb train station near Madison Square Garden in bid to disrupt the Republican National Convention. Arrested for conspiring to attack National Guard facilities and synagogues around Los Angeles. Convicted in 2008 (PDF) of conspiring to commit terrorism against Americans overseas. Gathered surveillance and met with other terrorists about targets in Washington, D.C. Plotted to blow up Sears Tower. Plotted to attack PATH trains between New York and New Jersey. Twenty-four suspects arrested for plotting to blow up 10 U.S. jetliners with liquid explosives. This plot led to the regulation of liquids on planes. Kobie Diallo Williams and four other men are charged with conspiring to support the Taliban after training in Texas. Planned to set off grenades at a shopping mall near Chicago. The “Fort Dix Six” plotted to attack Fort Dix in New Jersey. Four men plotted to blow up fuel tanks and pipelines at JFK Airport in New York. German converts to Islam, plotting under the cover of the Islamic Jihad Union, are found to have explosives and plan to target one of the largest U.S. air bases in Europe. Pleaded guilty to conspiring with others to blow up targets in the U.S. and Europe. Najibullah Zazi and three other men are caught days before they detonate explosives in the New York City subway. American Bryant Neal Vinas gives al Qaeda leaders information to attack the LIRR. Arrested in plot to detonate a vehicle bomb outside a courthouse and kill federal employees. A Jordanian man is arrested in connection with a plot to bomb at a skyscraper in Dallas. A group of men are charged in plot to attack the Marine Corps base in Quantico. Two men are arrested on wide-ranging charges, including conspiracy to kill U.S. politicians, spanning the past decade. Five men from northern Virginia are arrested in Pakistan and charged with supporting al Qaeda. Were reported missing by their families. A man tries to detonate an explosive on a flight over Detroit. Also known as the underwear bomber. Man is arrested for funneling money (PDF) to terrorist organizations. Failed attempt to detonate a vehicle bomb in Times Square. A husband and wife compile a list of 20 targets to murder, including military and media figures, arrested as they were set to move into the operational phase. A man is arrested after planting a fake bomb outside Wrigley Field. Twin packages of explosives were shipped from Yemen to synagogues in Chicago. Ahmed is arrested in connection with a plot to blow up the D.C. Metro. A Christmas-tree lighting is targeted by a 19-year-old Somali man, Mohamed Osman Mohamud, busted in an FBI sting operation. Man arrested for plotting to blow up a U.S. Army recruiting center. Man arrested in bomb plot against military and political targets, including former President George W. Bush, in New York, Colorado, and California. Two men arrested in plot to attack a Manhattan synagogue. Two men are arrested in a plot to attack a military recruiting station in Seattle. A former army private is arrested in a plot to copycat attack at Fort Hood. This entry was posted in Columns, Featured Columns and tagged National Security. Bookmark the permalink.